For firearms and shooting sports enthusiasts, January of every year marks the single biggest event in the industry: SHOT Show. 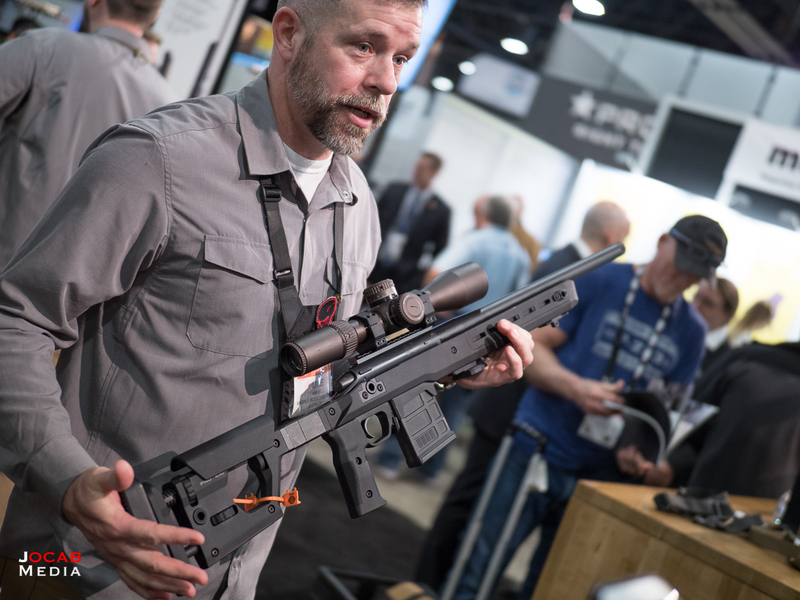 Just like the previous several years, SHOT Show 2018 took place in the Sands Expo Convention Center in Las Vegas (Nevada), and tens of thousands of exhibitors, media, and attendees made the trip to do it all again (or for some, the very first time). One topic I want to get out of the way is the tone of the 2018 SHOT Show after the Route 91 Harvest concert / festival shooting incident in the October prior. 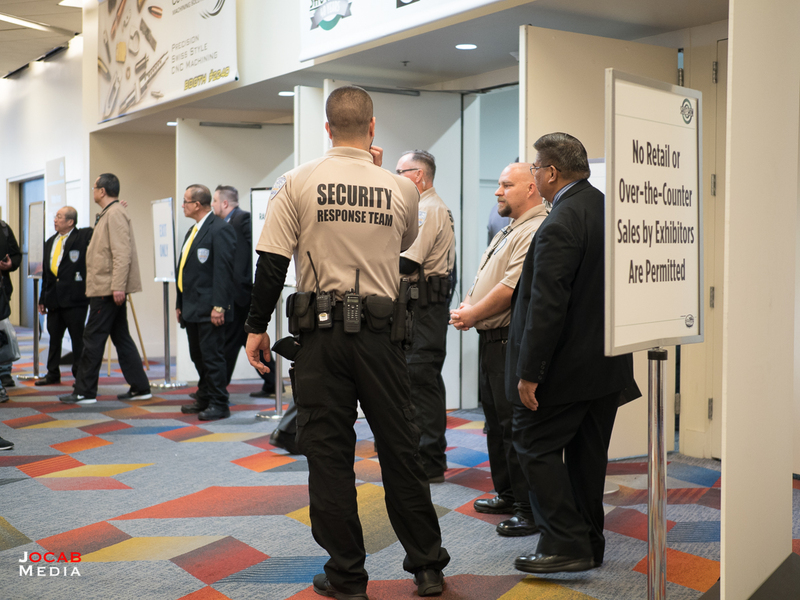 I observed more security at the SHOT Show than in previous years, particularly in terms of visible armed response. I also observed more scrutiny of attendees as they entered the SHOT Show controlled areas of the Sands Expo by the security personnel, checking badges more closely and looking for suspicious activity. Other than that, I did not observe or hear about any increased security checks for exhibitors, media, or attendees that otherwise prohibited or prevented folks from attending with firearms. Perhaps being the official SHOT Show hotel, the Venetian (and Palazzo) may have had specific security controls in place for anyone staying in the hotel, but I did not hear about it. 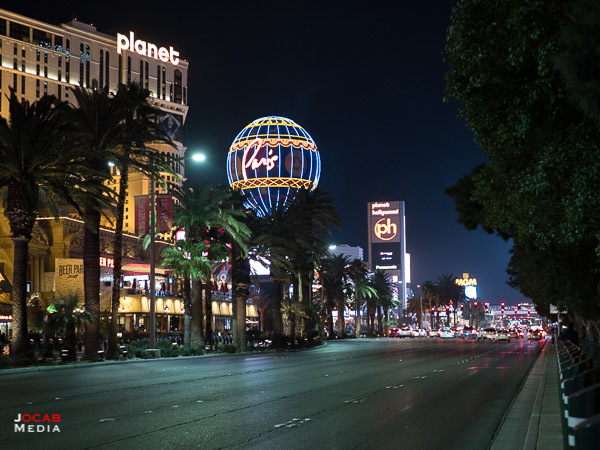 I stayed at the Monte Carlo (soon to be Park MGM) during 2018 SHOT Show. While I did not experience increased security checks, I did notice there were specific signs in the parking garage indicating a No Firearms or Pocket Knife policy for the T-Mobile Arena and the Park Theater (and not the Monte Carlo Hotel and Casino itself). Anyway, the 2018 SHOT Show began for me, like every other year prior, with a quick visit to the Geissele Automatics booth in the large second floor hall of the Sands Expo, specifically to acquire a free badge holder. Geissele hands out nice Cordura/nylon badge holders every year, that are nicer than the generic lanyards provided by the hosts of the SHOT Show, the National Shooting Sports Foundation (NSSF). I didn’t bother to bring my Blue Force Gear badge holder because the SHOT Show badges got wider a couple years ago, and needs to be trimmed to fit my BFG badge holder. So now I just get a free one at Geissele. 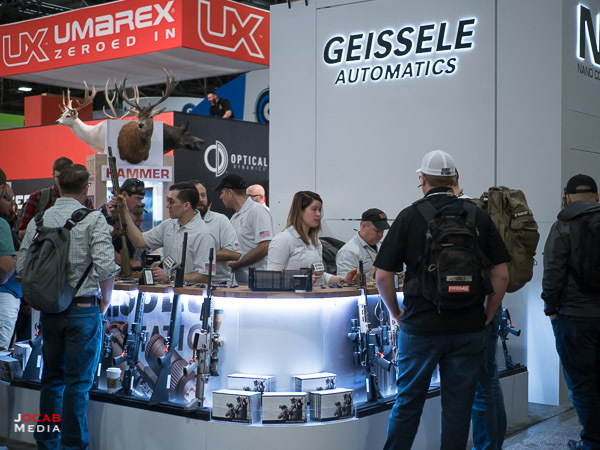 Tip to all SHOT Show attendees: Go to the Geissele booth on your first day to get a badge holder if you do not already have a good one. The first stop at Geissele included an examination of one new product that Bill Geissele introduced in an online live stream the week prior, and that is a trigger for a Remington 700 pattern action dubbed the Super 700. I will say I owe a lot to Geissele Automatics because of their Hi-Speed National Match 2-stage Service Rifle trigger. Geissele came out with their phenomenal trigger in the early to mid-2000s, right when I was pondering getting into competitive Service Rifle. I only have “pre-ban” (California) AR-15s with the Colt large pin, and there was no quality National Match 2-stage trigger available in a large pin configuration until Geissele Automatics. I acquired the Geissele Hi-Speed NM Service Rifle trigger for my Colt large pin lower, and the rest is history, culminating in my Distinguished Rifleman badge in 2009. As far as 2-stage AR-15 triggers, I have been a huge Geissele advocate. So when Bill Geissele announced his new 700 pattern trigger, I was intrigued, especially when he indicated the same exact trigger could be run in a single or 2-stage configuration. The trigger would be sold pre-configured in either a single or 2-stage setup depending on the customer’s initial desire. But the trigger could be switched by the user at any time. The pull weight is user adjustable between 0.75 lb and 3.5 lb. I dry fired the trigger and it was what I expected from a Geissele trigger in terms of zero creep and a clean break. I did not notice much over travel in the Super 700 and it is unknown if this can be adjusted. I will admit that I am not all that excited by this trigger. I am actually split 50/50 on my use of either a single stage or a 2-stage in a bolt rifle. I can use either one, as long as the trigger break is consistent and clean every time. You would think having a trigger that can be switched back and forth depending on my mood would be good for me. But I think that characteristic is a novelty for me. 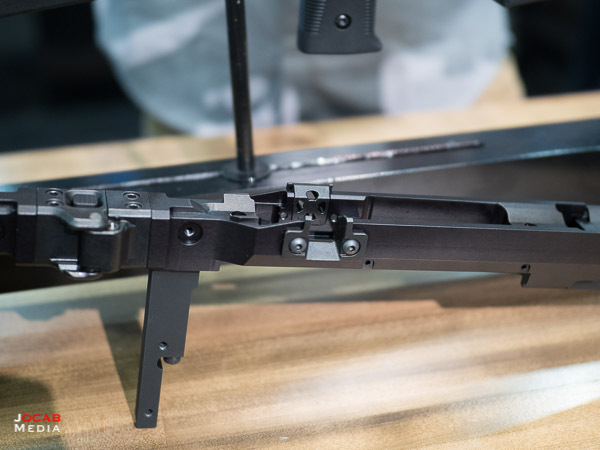 If anything, a convertible trigger is more of a design benefit for Geissele since they can simply produce one trigger for two different audiences and shooter preference. At this point, the 700 trigger market is very diverse, and there are a lot of options out there. 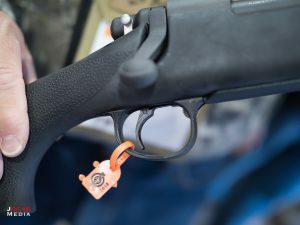 The Super 700 trigger does incorporate multiple safety mechanisms in the design, perhaps to take advantage of the bad reputation of the Remington 700 OEM trigger, and help promote the Geissele Super 700. Releasing a 700 pattern trigger is a good move by Geissele, since they are going to tap into a very large market. Combined with the existing Geissele customer base and the solid reputation with their AR-15 triggers, I am sure many Super 700 triggers will be sold. The initially announced price of $250 is on par with some of the higher end 700 pattern triggers on the market. I will probably acquire a Super 700 after the first run is released to test out the adjustment range as well as the single to 2-stage conversion. 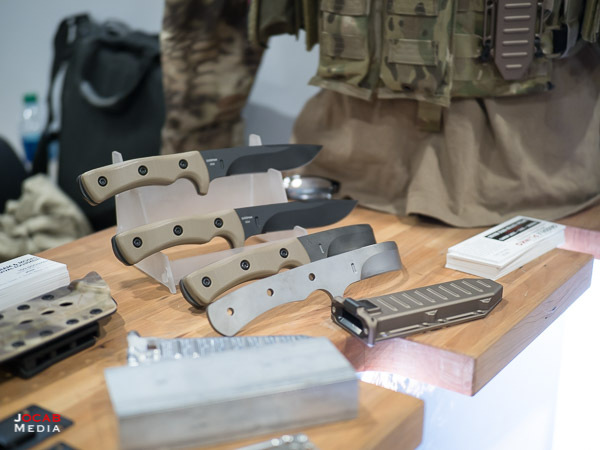 One interesting product of note at the Geissele / ALG Defense booth is the aluminum sheath made by Geissele for the Abraham and Moses ‘Goodman’ knife. The Lou Goodman Special Operations Combat Knife by Abraham and Moses Survival Equipment is a high end fixed blade knife that is 10-5/8″ long with a 5.655” blade made out of Carpenter PD1 steel. The knife was present at the Geissele booth because of the partnership with Geissele to manufacture the sheath, which incorporates an active retention system to prevent the knife from dropping out while inverted, and supports MOLLE and lanyard attachment points. More information on the Goodman knife can be found on the Abraham and Moses Survival Equipment website. 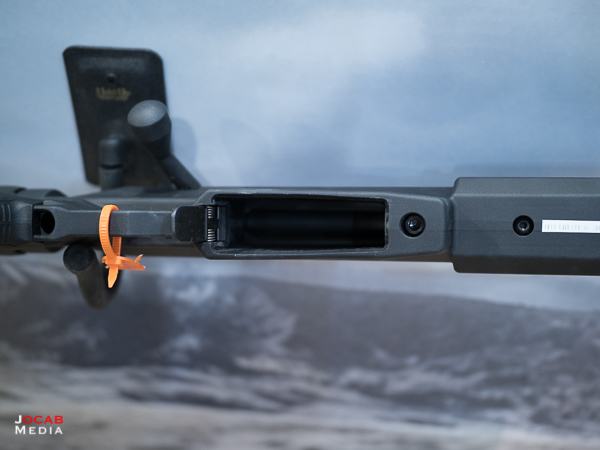 While on the subject of Remington 700 upgrades, Magpul recently announced their own Remington 700 chassis system in the weeks leading up to SHOT Show 2018. Dubbed the Pro 700 Rifle Chassis, this new Magpul rifle chassis delivers a lot of features you present in other chassis designs, such as an aluminum V-bedding block, adjustable length of pull and cheek height, and AICS compatible magazine well. But the Magpul Pro 700 does have a few design characteristics that make it very interesting. One is the fact that it is ambidextrous in that it will accommodate both right-handed and left-handed actions. The bolt lever ‘inlet’ is actually on both sides of the chassis, but is covered by a plate that is moved to either side, that also serves as a QD sling swivel attachment point. The cheek riser is also reversible, moving the adjustment knob to the side opposite of the face as needed, and the hinge for the folding stock can be swapped to either side. One design feature that caught my eye is the ability to move the grip fore and aft in order to give some customization the grip to trigger distance. This adjustment range is 0.75″ and should help shooters get a more fine tuned trigger pull motion. From what I can tell, this means the grip is proprietary to the Magpul Pro 700, as opposed to using an AR-15 compatible grip (as many aftermarket chassis systems are designed for). The weight of the chassis with the full billet aluminum skeleton and polymer skin is approximately 5.4 lbs, which is similar in weight to the other systems out there. 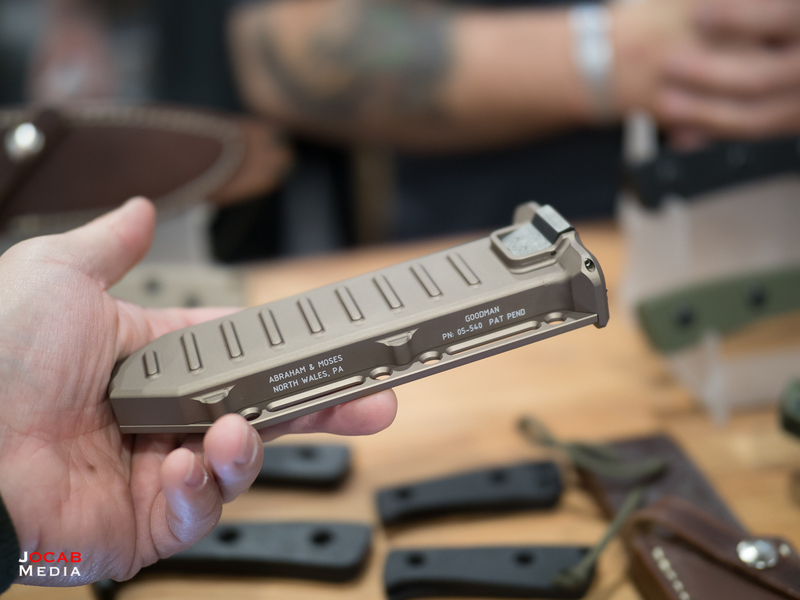 The price for the Magpul Pro 700 chassis is $995 and it will be available in black, OD green, and flat dark earth. The price of this chassis is actually comparable to other chassis systems on the market for the 700 pattern actions. Like the Geissele Super 700 trigger, the Magpul Pro 700 Rifle Chassis is entering an already well established market segment with many existing options. Magpul has always been known as an AR-15 accessories manufacturer, but has been branching out to other rifle platforms in recent years. Magpul is obviously a huge name in the shooting industry, so I have no doubt we will see many Remington 700 rifle owners buying a Magpul Pro 700 Rifle Chassis. But I anticipate much of the initial demand will be from the mainstream consumer market, particularly novice shooters and those shooters who are not familiar with custom bolt action rifle parts from the niche to high-end manufacturers. Although, I predict the Magpul Pro 700 wiil take a bite out of future Accuracy International chassis sales. The ATAICS and the AXAICS by Accuracy International are two of the most recognizable chassis systems by consumers, but the prices are above the $1000 USD mark (with the AX AICS going for above $1600). Obviously, the ATAICS and AXAICS have different features and design points that distinguish them from other chassis systems. But given the Magpul Pro 700 has a similar core design (aluminum chassis with V-block, surrounded by a fully adjustable polymer skin) at a $1000 price point, I can only predict that anyone considering buying at ATAICS (or AXAICS), will see the Magpul Pro 700, and decide that the Magpul offering makes more sense in terms of price and adjustment features. Of course, Magpul has a bit of history of making revisions to products, so those folks who are familiar with Magpul and want the Pro 700 may opt to wait for the initial production run bugs to be worked out, or even until a Gen 2 version is released. 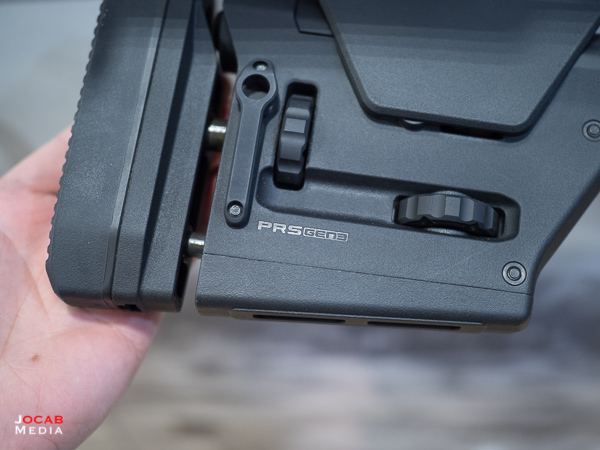 I was told the Pro 700 has a release date of Q2 2018, but given that this is Magpul (sorry, Magpul), I advise potential buyers not to hold your breath. 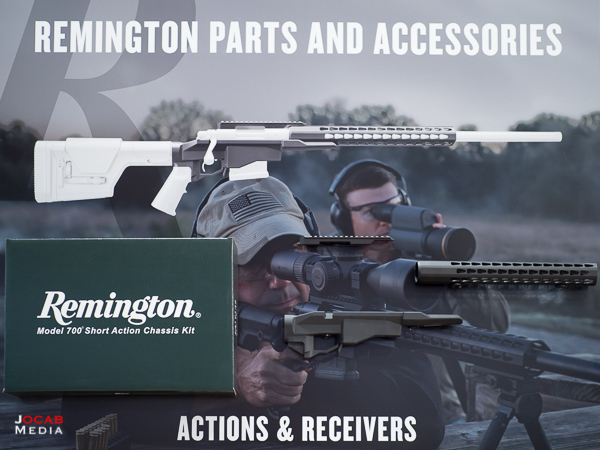 Since I am talking about Remington 700 aftermarket accessories, it is a good time to bring up the new Remington 700 PCR (Precision Chassis Rifle). Remington has sold a 700 rifle in a chassis configuration, but under the Remington Defense (military) line, in the form of the MSR and XM2010. But these rifles are very difficult to obtain on the civilian market, and can run for $10,000 USD and up depending on the configuration. 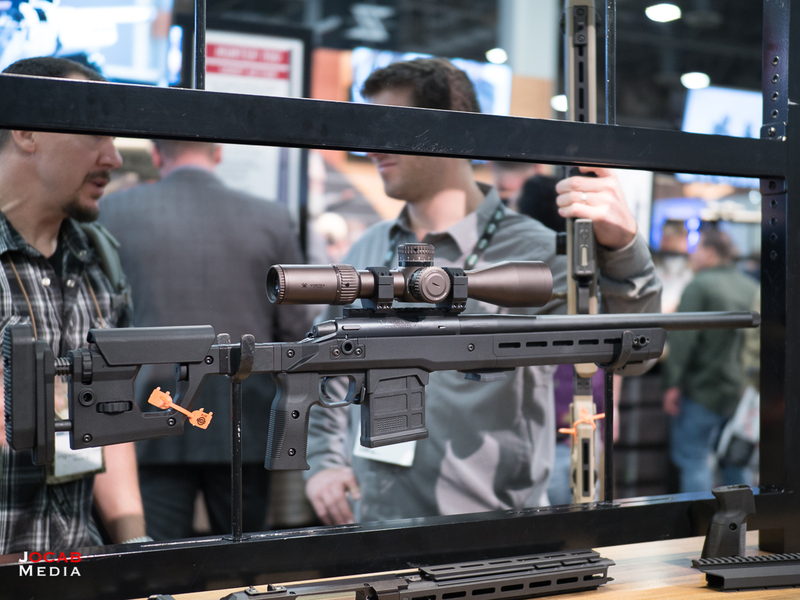 The lack of an affordable factory rifle in a chassis configuration has hurt Remington since Remington’s competitors such as Savage Arms, Tikka, Ruger, and Howa all sell rifles in a chassis at a price point of $1000, give or take. I feel that the loss of sales to these competitors has forced Remington’s hand in terms of selling a factory rifle in a chassis system at prices most consumers can afford. Anyway, the Remington Model 700 PCR appears to be a basic modular chassis, made out of anodized aluminum, where the core that holds the action accepts an AICS magazine. The stock and grip are both Magpul accessories, with the stock being a PRS Gen 3. As far as the handguard, it is SquareDrop and Keymod compatible, and it appears to attach via screws on the bottom of the chassis. The Remington Model 700 PCR is a bit of an odd configuration. 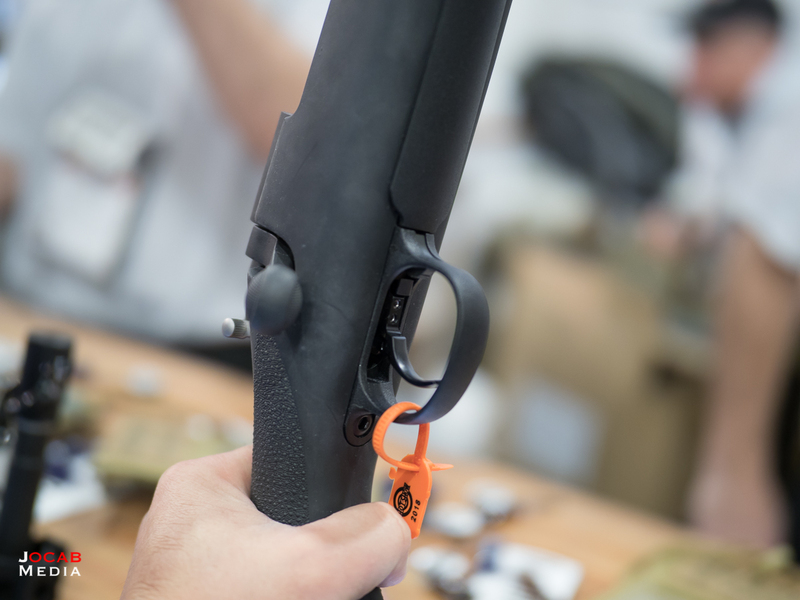 Unlike the 700 5-R Gen 2 which is stainless steel with black Cerakote, the 700 PCR appears to be blued carbon steel, but with a 24″ 5R barrel and a threaded muzzle. The PCR is actually listed for $50 less than the 700 5-R Gen 2, at $1199 versus the $1249 for the 5-R Gen 2. I am not sure why Remington just didn’t take the Cerakoted barreled action of the 5-R Gen 2, and slap it in their new chassis. The new Remington Chassis is looks like it may be available as a standalone accessory for existing 700 owners. I did not pick up a spec sheet or talk to anyone at the Remington booth about the PCR or the chassis kit, because I expected details would be available on their website. Sadly, I was mistaken, and I am not sure on the pricing or availability of the chassis kit. But what kind of interest will there be for the Remington Model 700 Short Action Chassis Kit? If you are buying a chassis to replace a standard stock on a Remington 700, I would assume you would look at more established chassis systems (e.g. Accuracy International, Masterpiece Arms, etc.). In my opinion, the Remington Model 700 PCR is a necessary move on Remington’s part to regain some marketshare, especially after the Ruger Precision Rifle and the Savage Arms BA Stealth have sold so well for the past couple of years. But while a necessary move, I think it comes off as a very generic execution. 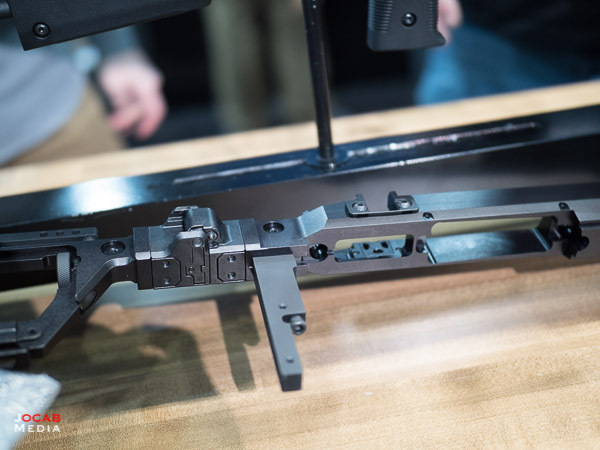 Granted, the PCR chassis is about as innovative as the chassis for the RPR or the Savage BA Stealth, but the fact remains that Remington is late to the party. With this amount of time, they could have come up with something a bit more impressive. Given that Remington is using a Magpul buttstock and pistol grip on the PCR, and has set precedence by using the Magpul Hunter 700 stock for a factory rifle, Remington could have just used the aforementioned Magpul Pro 700 chassis for their consumer 700 chassis based factory rifle. But perhaps this was Remington’s best way to come out with an out-of-the-box Remington 700 rifle in a chassis configuration, at a price point that undercuts the RPR and Savage BA Stealth. 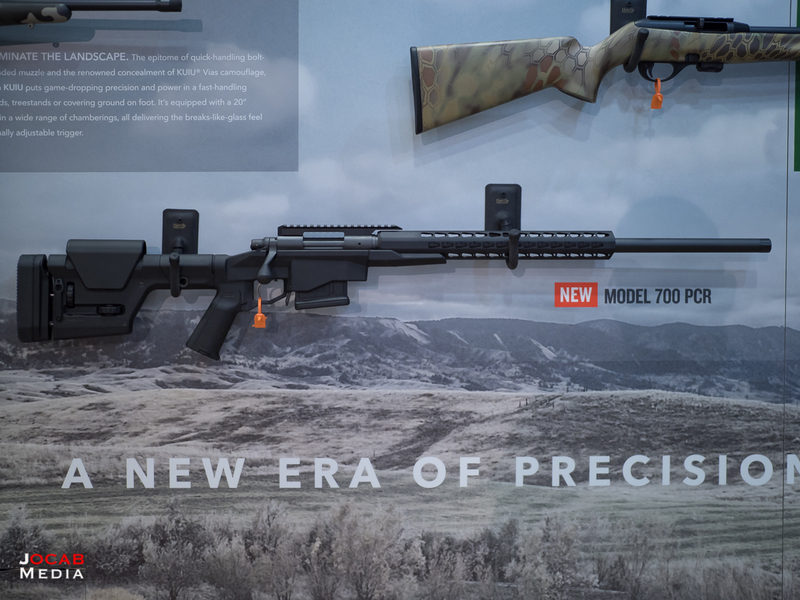 I have mixed feelings on the potential success of the Remington Model 700 PCR. I want to say it will make minimal impact, but given that the general consumer still reveres the Model 700 over other rifle actions, this could be enough to bring back new rifle buyers. 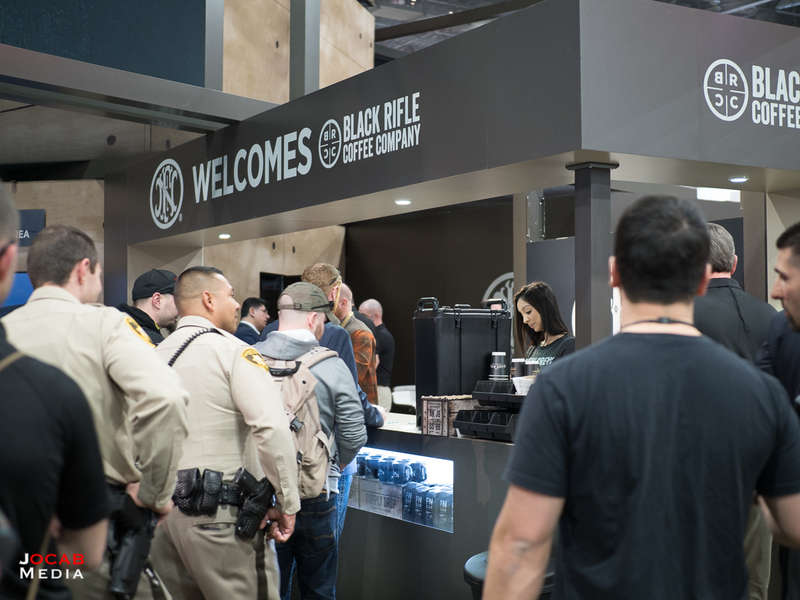 There is quite a bit of swag that can be acquired at SHOT Show, but one promotional 2018 SHOT Show attendees most likely obtained was from the Black Rifle Coffee Company who was partnered with FN. 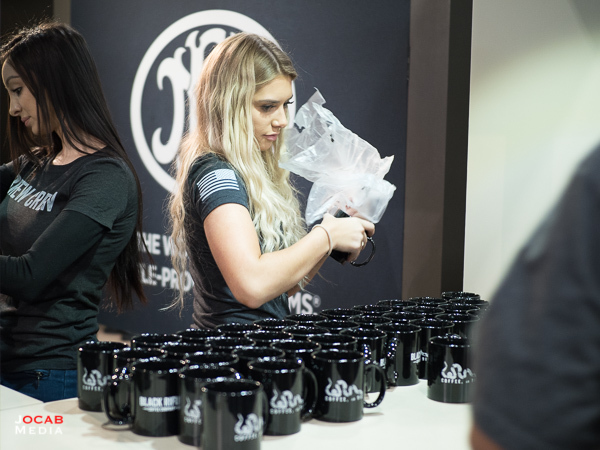 Not only was the Black Rifle Coffee Company handing out free coffee, but they were also giving away free coffee mugs. This marks the end of Part 1 of my 2018 SHOT Show After Action Report. Stay tuned for Part 2 in the next day or two. When in doubt, always refer to 2018 SHOT Show After Action Report – Part 0 which serves as the index for every published segment of my 2018 SHOT Shot AARs. GREAT review, look forward to more !! !